ELLIJAY, Ga. – Getting healthy and being fit is a goal we all seek to achieve, and this should be considered a long-term commitment. This year, 2018, could be your year of achieving this goal. All that’s needed is a strong determination and a plan. FetchForce has made a commitment with Workout Anytime 24/7 in Ellijay to launch a 90-day fitness challenge and invite you to join us! Workout Anytime 24/7 is a fitness facility that is known for their knowledgeable staff, friendly member atmosphere, and affordable membership programs. 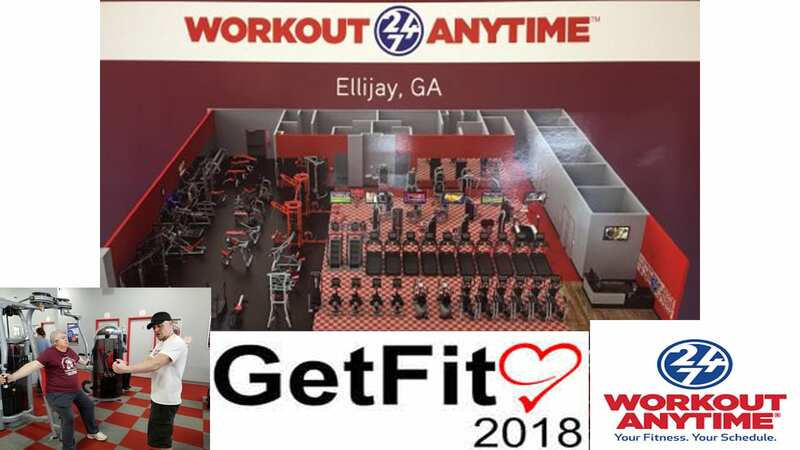 We needed guidance in our journey, so we decided to join our FetchForce with Workout Anytime Ellijay and found it to be our new home for top-notch customer service and user-friendly equipment. Our goals outside of being healthy and living a longer life is to share our Fitness Challenge week by week to give you insight on how you can make the same commitment! Meet our FetchForce Team who decided to share their journey to encourage everyone to make this your best year yet! Below is our first session, and we put Mr. Grouchy Pants (aka BKP) as the first trainee. See us walk through our initial step in being Fit with Fetch and Workout Anytime 24/7! If you are ready for real results, Workout Anytime Ellijay is here for you, 24/7! Contact us at info@FetchYourNews.com to find out how you can start your challenge! The first time in at Workout Anytime 24/7 Ellijay our team members met individually with one of their qualified trainers, Scott Patora, who performed a Success Session where he did an evaluation to determine our goals and needs so he could begin a plan. Each team member took measurements, weighed in, and our trainer used equipment to determine our BMI and body fat. (BMI is a number that is used to evaluate your body size. It is not a percentage of body fat, but rather a general score that helps determine if your weight falls into a healthy range.) Once we were told where we are, we discussed where we wanted to be and set our goals. Along our journey we will all share how our challenge is progressing with weekly updates. Scott walked us through exercise equipment and explained proper technique. He also explained the best way to attack specific body areas we wanted to focus on improving. We found Scott to be very personable and knowledgeable and realized how invaluable his guidance was going to be to help us reach our goals. Trainers are available to schedule training to work with your schedule.